If you are thinking of using PowerShell for a logon script – think again. Much as I loved grappling with old DOS batch files and perfecting the superior VBScript logon scripts, I admit there are better ways of achieving a task than a PowerShell logon script. Whatever your worthy project to control the users desktop environment, start with Group Policy. Incidentally, even if you end up ignoring my advice, you will still probably need a Group Policy to push out your logon script. PowerShell Logon Scripts – If You Must! Back to PowerShell and logon scripts, PowerShell was designed as a command line method for configuring the operating system and not for tweaking users’ environments. In particular, the security and script execution methods employed by PowerShell are unsuited to running on client machines. Even if you succeed in getting a PowerShell logon scripts to run, you have to ask was it worth it? Surely there must be a better way of providing a default printer or access to a network share. The problem is that you cannot simply assign a .ps1 file as a logon script; because, by design, Windows 7 or Vista won’t be able to execute it. Fortunately, there is a work-around and that is to create a VBScript script which calls your PowerShell script. To my mind this whole procedure is telling me clearly, this is not the best way of configuring logon settings. 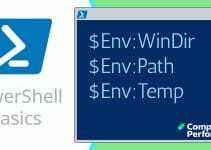 Version 2.0 transforms PowerShell’s remoting, Windows 7 and Windows Server 2008 R2 provide the menus to configure PowerShell scripts to run via Group Policy. When Group Policy was delivered with Windows 2000, it allowed administrators to execute batch file-based scripts at user logon or logoff, as well as at computer startup and shutdown. This enabled administrators to configure parts of the environment or execute additional programs during those times. Windows 7 introduces support for executing PowerShell scripts as well, giving administrators more comprehensive tools for real-time configuration during these system events. 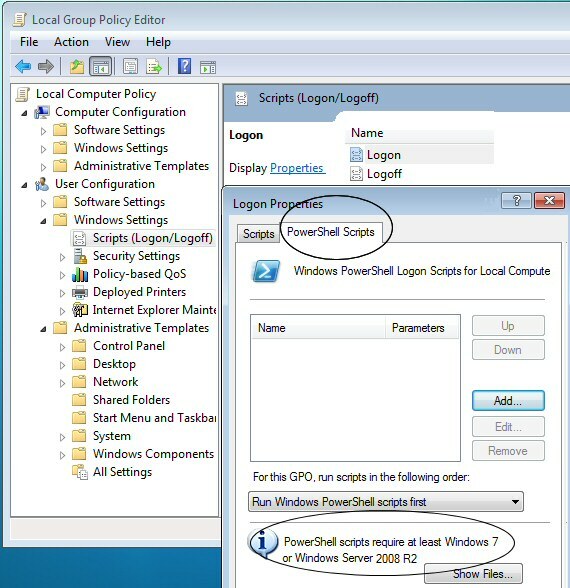 See more on Logon Script Group Policy. Here are the Group Policy paths to set the user and computer logon scripts. Although I spent many a happy hour experimenting with old DOS batch files and perfecting the superior VBScript logon scripts, I now realize there are better ways of achieving a task than a PowerShell logon script, start with Group Policy.